Loupe System produces a series of loupes which are build according to the same principles and requirements of a camera lens. The Model 01 loupe provides a 6x magnification through five multi-coated optical glass elements arranged in three groups. Most other loupes just use a single optical element to provide magnification. These loupes provide a good image only in the center of the viewing field. Along the edges you will inevitably see both chromatic aberration (i.e. diffraction, or color shift) and image distortion (i.e. the image becoming unfocused and/or straight lines appearing significantly curved). 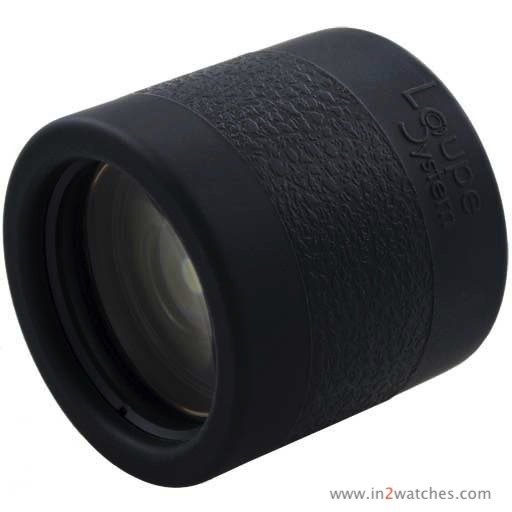 The weight of the Loupe System Model 01 varies from 125 to 130 grams, and prices from US$ 375,= to US$ 575,= for the different executions like rubber, carbon and leather finished. This entry was posted on January 21, 2013 at 11:41 and is filed under all, front page, news, uncategorized. You can follow any responses to this entry through the RSS 2.0 feed.